Today’s work was some gardening and shopping. We started by hanging out laundry and then we swept the deck of leaves. We then went to the garden and raked. We cleared up leaves, sticks and other items around the garden. We got all of this and put it in a wheelbarrow to take it to the front of the house as we planned to have a bonfire! We finished with this and had some lunch. We had a medley of fruit with a coffee! We both then went to get some shopping from Apollo Bay. We took the drive down the winding mountainous and forest areas and saw the beautiful views surrounding us on Apollo Bay. We arrived and took a quick walk on the beach as it was a much warmer day. We went to a couple of stores to find the items we needed and then we hopped back in the car and came back. We got back and made some dinner. We had a lovely roast dinner again! 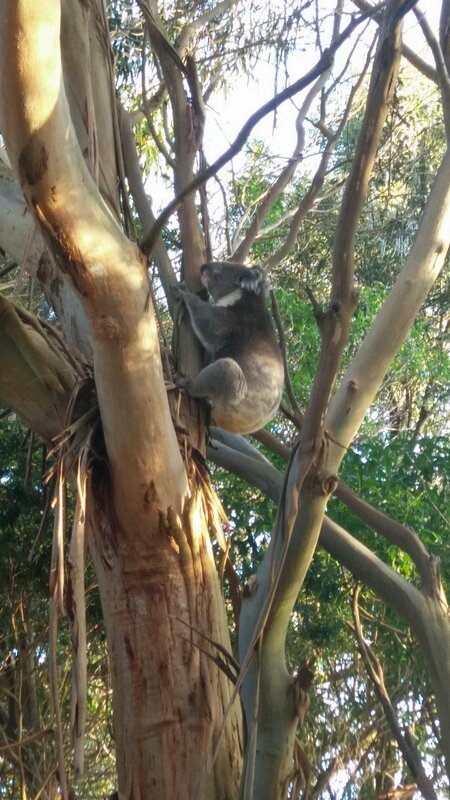 We saw a koala, and heard him! He was very low in the tree and was moving around. We finished the night watching some TV and drinking a hot chocolate…A perfect night! Previous PostPrevious Place 42 – Day 3: Apollo Bay: Kim’s Birthday 🎉🎈, Busy Day & We Got A Kidd!